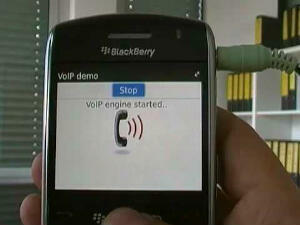 Make free calls using the Voice over Internet Protocol (VoIP) services for blackberry. If you own a blackberry phone and would like to make free or cheap calls, here are a few services that will allow you make free calls with your blackberry phone both locally and internationally. The Google voice mobile app allows you to make calls and send sms directly with your mobile phone using your Google voice number. The app allows users access to voicemail and will also be integrated with the phonebook on the device. Available for US residents only. Everyone loves viber. Viber is a cross-platform instant messaging VoIP service which is available on almost all platforms and devices. Viber allows its over 200 million users worldwide to send messages, photos and make free calls over 3G and Wi-Fi. You get to use your regular phone number and contact list. Viber is available for BlackBerry, iOS, Android, Windows Phone, Symbian, Series 40, Linux, Mac OS, Micosoft Windows and even the Samsung Bada OS. TringMe is a complete VoIP service that allows Blackberry owners to make free phone calls over 3G or Wi-Fi. The beauty of this app is that it operates within your local network and you get to use your regular phone number to make calls and send texts. TringMe was the first VoIP service to release an app for BlackBerry. Has API for developers to build their own apps. Works on a limited number of phones.